The Hazelbaker historian and contributor to this site, Jill Foley, collected this wonderful resource from the Citizen's Library in Washington, PA. It was prepared by members of a local church to which some Hazelbakers attended. It is particularly rich in lore about George Hazelbaker, one of Peter's sons. In fact, Jill sent us the Will of George Hazelbaker! I understand that there are some possible errors and misinterpretations in this material, but that is the nature of the genealogy game and why there is still work for us contemporaries. Also in the document is a survey of the Church Cemetery containing some Hazelbakers. 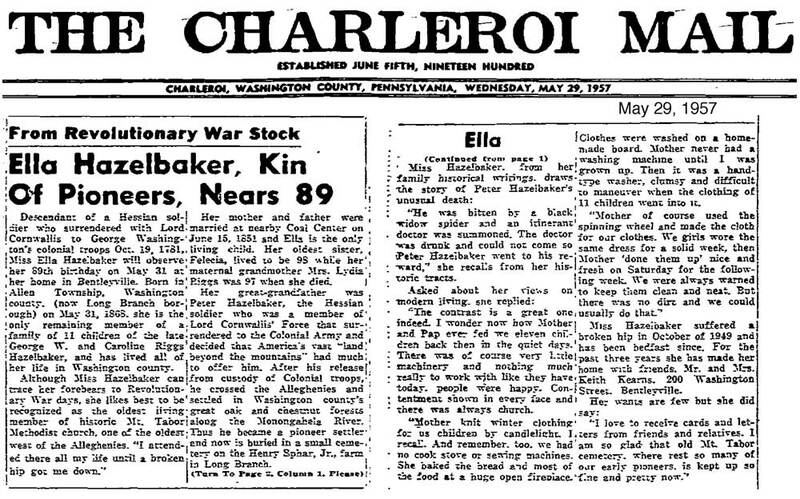 Mar 30, 2010 Addendum: While browsing in Ancestry.com, I found this newspaper article describing the life of Ella Hazelbaker, Great-granddaughter of Peter Hazelbaker. Ella lived her entire long life in Washington County. (The text of the article had already been incorporated in to the notes of Jack White's database on this website.) Of interest is an alternate version of the story of how Peter died. Rather than poor doctoring, the drunk doctor did not come at all. "Family Historical Documents" are described. What are these? Does anyone have more of them?